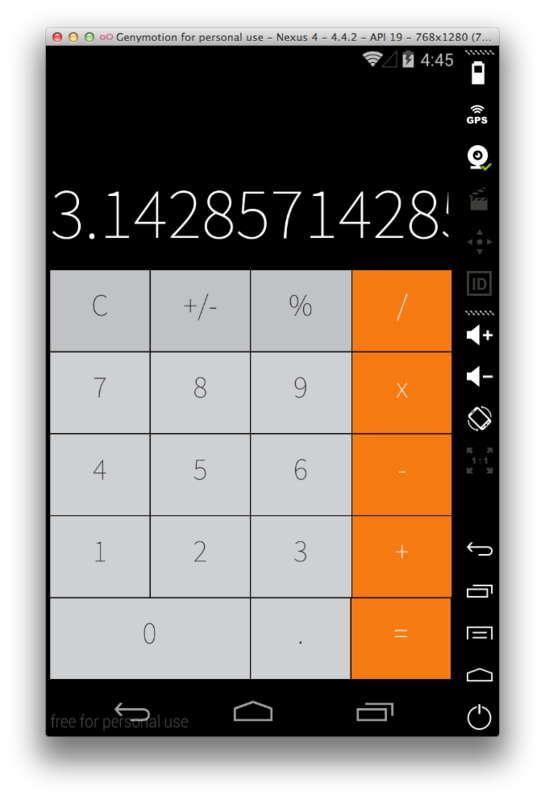 I’ve written quite a bit about the unbelievable crappiness of the Android emulator. On a machine with a lot of horsepower it is manageable at best. Previously I’ve written about using a VirtualBox emulator for Android development with AndroVM. Well, AndroVM was bought by a company named Genymobile last year. They have created a brand new product named, Genymotion and the results are nothing less that amazing. Genymotion has a large library of emulated devices available. You need an HTC One? They have it. Need a Nexus 10? They have it. And rather than having to fiddle around with the settings of VirtualBox, a place where few feel comfortable, Genymotion takes care of all of that for you. With three basic steps you can forget all about the sluggish Android emulator and move your Android development into the fast lane. And best of all it is free for personal use. So all of you night and weekend code warriors won’t have to tap into your piggy banks. I am going to give the instructions for the Mac, but Genymotion is also available for PC and Linux. The instruction are pretty similar across all platforms, except that for the PC you don’t need to download VirtualBox, they have a combined VirtualBox/Genymotion install package. VirtualBox is a free virtual machine app. It is required by the Genymotion emulator. Double click the dmg file and follow instructions. Genymotion is a virtual machine based emulator for Android. It not a Google product. It is unbelievably fast. It is fast enough to play arcade games on it. They have a wide variety of devices in the emulator library. My normal workflow is to build and test on emulators and once I am confident I will test on actual hardware. Their emulators are also nice when demo an app on a projector. It is free for private use, but you must be registered in order to download it. To register. They will send a link to your email address in order to confirm it. Click the link and you are in. I would recommend initially downloading a Nexus 4 (phone). And that is it you should now be up and running with Genymotion’s Emulator. Have fun. Goodbye VBox grub bootloader fiddling….